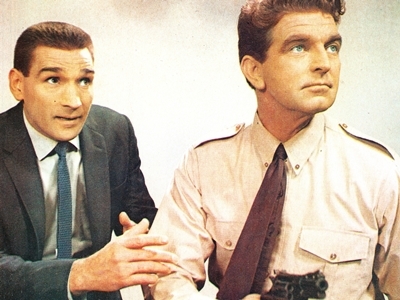 Fifty years ago saw the debut of the Nine Network‘s new spy drama, Hunter. 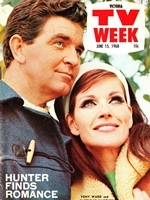 Produced by Crawford Productions, Hunter‘s first episode aired on GTV9, Melbourne, on 5 July 1967 — with sister station TCN9, Sydney, following suit the next night. 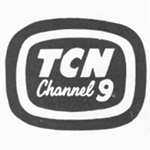 However, given the vagarities of Australian network programming at that time, the series actually made its debut in Adelaide, on NWS9 on 4 July. The title role of COSMIC (Commonwealth Office of Security and Military Intelligence Co-ordination) secret agent John Hunter was played by Tony Ward, an actor who had also been working as a current affairs reporter. He had joined the Melbourne-based Hunter after working on Sydney current affairs shows Seven Days and Telescope. Hunter also made a star of acting newcomer Gerard Kennedy, who played Kragg, a chief agent working for the fictitious Council for the Unification of the Communist World (CUCW). Kennedy went on to win a TV Week Logie Award for Best New Talent for his performance in Hunter. Hunter‘s regular cast also included Nigel Lovell, Fernande Glyn and Ronald Morse. 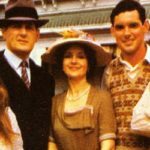 Unlike Crawfords’ other series Homicide, which was set in Melbourne, Hunter came with a more impressive budget and worked from a much wider landscape and which gave it more sophisticated look. Although the series was based in Melbourne, production went out on location to Sydney, Queensland, central Australia and even to Singapore. 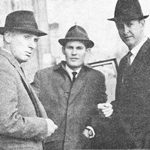 The series ran for 65 episodes, with Nine and Crawfords opting to pursue a new Melbourne crime drama, Division 4. Gerard Kennedy went on to the new show’s lead role, winning two TV Week Gold Logies for his popularity. 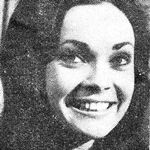 Ward, who had left Hunter before the end of its run, having been somewhat upstaged in profile by Kennedy, went on to dramas The Long Arm, Delta and Dynasty and would go back to current affairs reporting, working for Nine’s A Current Affair. Source: Classic Australian TV, IMDB. TV Times, 5 July 1967. Sydney Morning Herald, 6 July 1967. 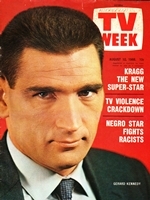 TV Week, 15 June 1968, 10 August 1968. She seemed to disappear after about 1970. She was the daughter of well known radio actress, Neva Carr Glynn and her husband – forget his name – also a radio veteran. They appeared in daily serials on our radio for housewives. These actors went out of work when TV took over. We also had the ARGONAUTS for children and serials for then in afternoons. It kept these qualified people in regular work. So many radio stars gone now Stewart Ginn, John Ewart, Moray Powell, Gwen Plumb, Hilary Bamberg – the latter I met when visiting 2GB studios in 60’s to watch a serial being recorded. At that time the writing was on the wall about the end of these serials. Neva’s son was also in radio. to add – Neva was married to John Tate, actor and producer [I think] and their son was Nick Tate, actor too. A very accomplished family in the radio and television acting. Loved the Ericofon too ! Interestingly, Gerard Kennedy had been doing drama plays on Brisbane TV as early as 1963, before coming to notice in 1966 via guest roles on “Homicide”. Tony Ward had also done a couple of ABC drama plays in the early 60’s, and returned to acting briefly in “Sons & Daughters”. What a great website !. I’d like to see something about SKIPPY….Has anyone Pictures of the Ranger Uniform Sleeve Patches ?.